Today we are happy to introduce Kim Harrington, author of the young adult novels Forget Me (Penguin/Speak), The Dead and Buried, Clarity, and Perception (Scholastic), as well as the middle-grade series Sleuth or Dare (Scholastic). 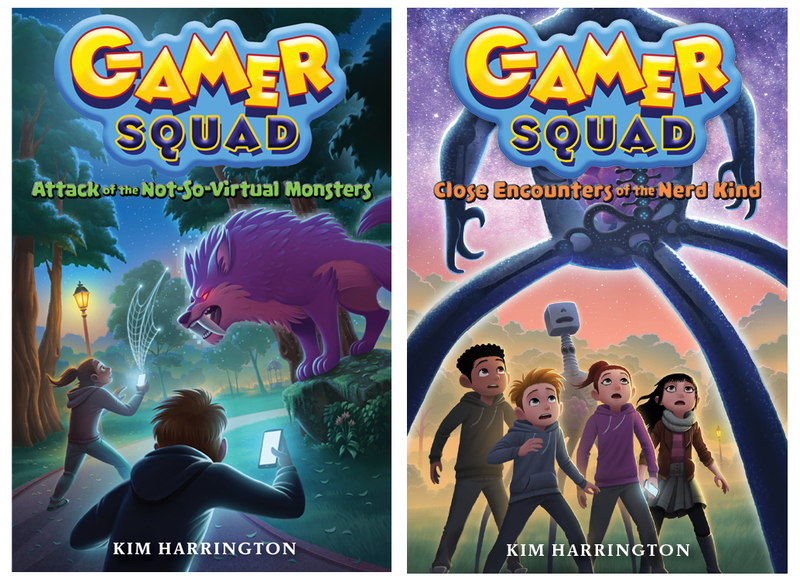 Be sure to enter her giveaway of her newest MG books in the GAMER SQUAD series (Sterling Children's Books). Tell us about your background and how you came to write for teens and kids. I always wanted to be a writer, ever since second or third grade. But I abandoned the idea for something more “practical” when I went away to college. 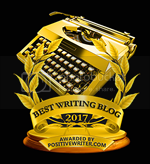 I returned to writing after my son was born. Congrats on your recent GAMER SQUAD books. Tell us about them and what inspired you. 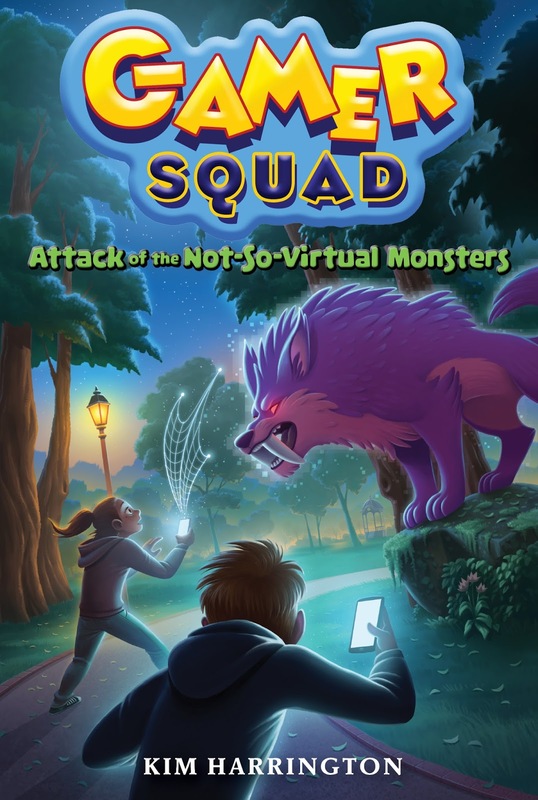 GAMER SQUAD is a fun adventure series about a group of gamer kids who have to save their town from mobile game related disasters. 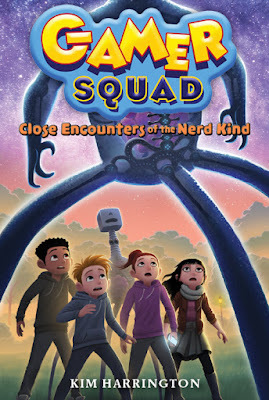 The books have humor and heart, portray friendship ups and downs, encourage girls in STEM, and focus on a love for community. I’ve been playing games since the ‘80s when I got my first Commodore 64. And like my main character, Bex, I also did some programming. So the series was inspired by my love for technology and the new mobile games that are all the rage right now. I thought it would be fun to imagine what if your favorite video game came to life? Definitely long and windy. I wrote a lot as a kid, but gave it up for many years. Then I returned to it much later and the difference this time was that I didn’t give up. I wrote three books that did not sell and kept on going. My fourth was the magic number. 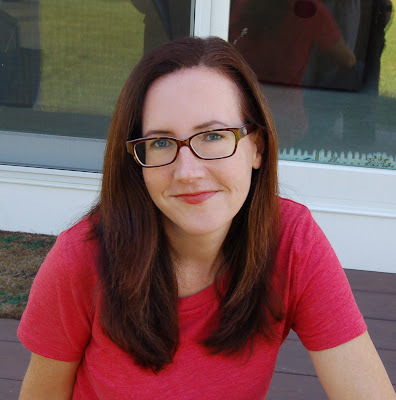 You write both YA and MG. What are the main differences in the way you approach these ages? My YA books are all mysteries and thrillers. And while I have some elements of mystery in my MG books, they have to be more age appropriate. I can’t have a serial killer working his way through town. ;) While my voice is different in YA and MG, I definitely enjoy using humor in both. Right now I’m working on an uncontracted MG that is one of my favorite books ever. So I’m crossing my fingers that it will sell when I’m done. What advice would you give to your younger self? 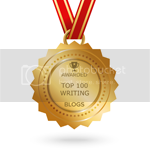 Is this the same as you would give to aspiring authors? This may sound weird but I wouldn’t give myself any advice. I love my life and I’m scared that any advice I gave would cause me to make a different choice along the way, and I wouldn’t want to end up anywhere other than where I am. To aspiring authors, I’d say don’t give up. The interesting thing about this job is that it’s not over until you say it is. The only person who can fire you is you. So don’t quit, keep learning, keep trying, keep plugging away. Because I’m so outgoing online, I think people would be surprised to find out that I’m painfully shy in person. Like really, really shy. Unless you know me. Then I don’t shut up. This looks like a series my kids would love. Thanks! Just listened to your agent on Literaticast too. Sounds fun! Great advice for all artists to remember--only you can choose to give up. I love humor in writing as well as mysteries so your writing will be fun for me to read and study as a want-to-be middle grade author.